Complete Multi-Choice Box Editor is a simple tool for editing the Multi-Choice Boxes in Pokemon Games. It handles all the repointing for you, you never have to type in an offset… ever. If you do however, it will put the data where you tell it… it assumes you mean to put it there, even if its overwriting stuff. 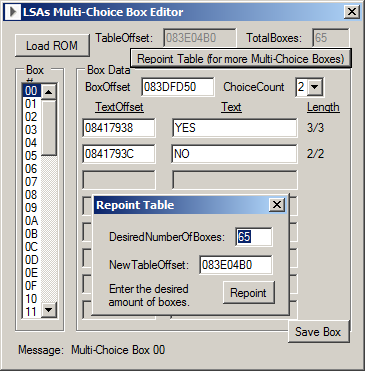 If you repoint the table or change a box and it gets repointed, the tool removes the old table or box data, freeing up space, so repointing the table more than once wont be wasting space. This is not the case for text offsets though, if the text gets longer and ends up being repointed, it leaves the old text(important because some boxes reuse the same text). Currently only supports BPRE 1.0. UPDATE: Version 1.1 Supports FireRed(BPRE) and Emerald(BPEE).